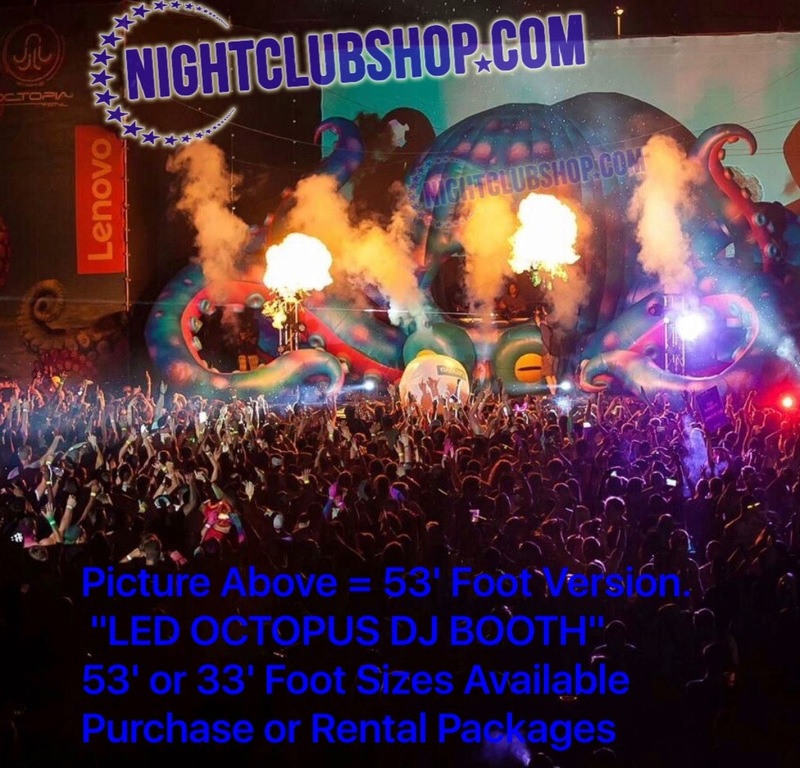 SHOW READY: "LED DJ Inflatable, Octopus DJ Booth"
The amazing and impressive inflatable LED octopus DJ booth is currently the biggest inflatable that our custom shop manufactures and produces. 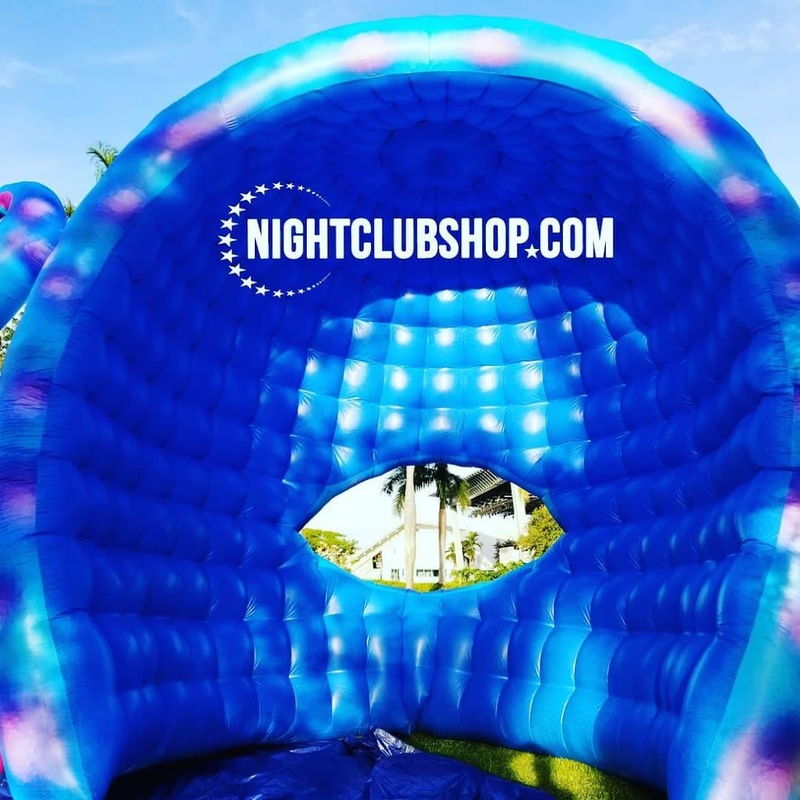 Custom made for each and every venue or client, It is currently made in the 33′ or 53′ version standard size or the inflatable piece can be made to needed size, custom tailored depending on your space and needs. 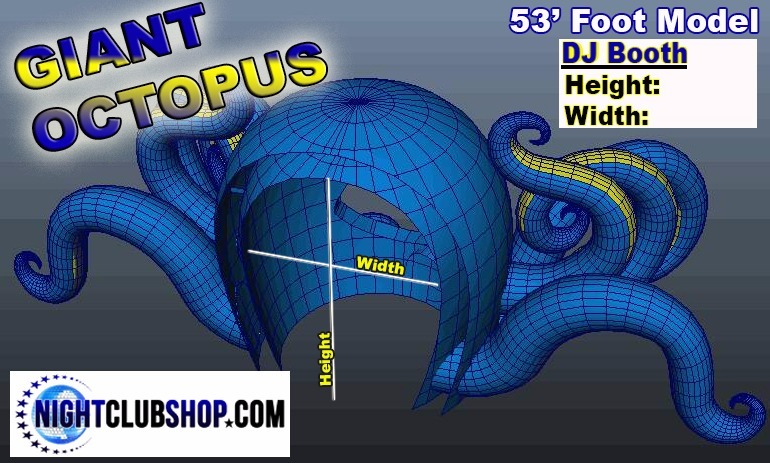 The units tentacles are also maneuverable to fit or wrap-around your space as an added decorative and themed look to make this Dj booth one of a kind at each and every different install or setup. Made and printed on Oxford fabric, this unit is also flame retardant and fireproof as well as water resistant, designed to last and endure the elements outdoors. The Octopus DJ Booth Cabin is covered by the Octopus Head and inside is very spacious, made with more than enough room to fit a Dj Table. The Dj Booth window is conveniently placed facing out through the Front of the Octopus facing the crowd. Each different size measures a bit different but the standard 53′ Version has a Dj Cabin and Head Cavity that is 18 Feet in height, 16 feet deep, and 16 Feet wide. It is made with the consideration of protecting the Electronic gear from the elements while giving more than enough room to fit a Dj Booth, table, amp rack, and maybe even a small sitting area. 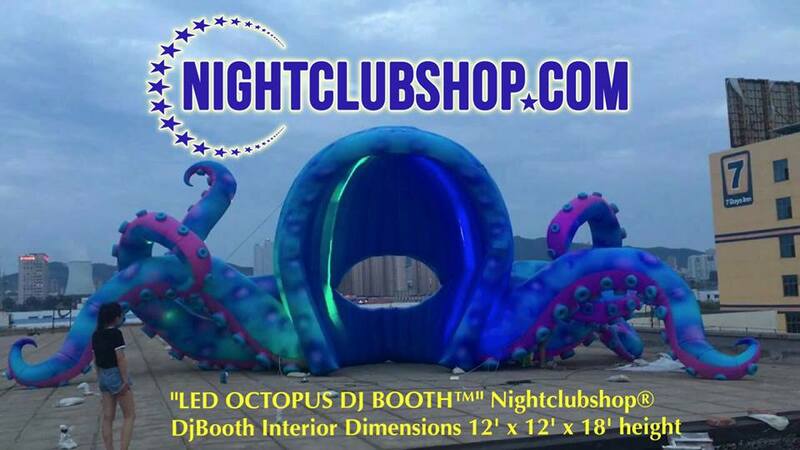 This LED octopus DJ booth is also lined with LED strips inside throughout each tentacle and the head cavity and body. It comes with a wireless remote control for the actual interior LED lights, Giving the user control of interior LEDs. 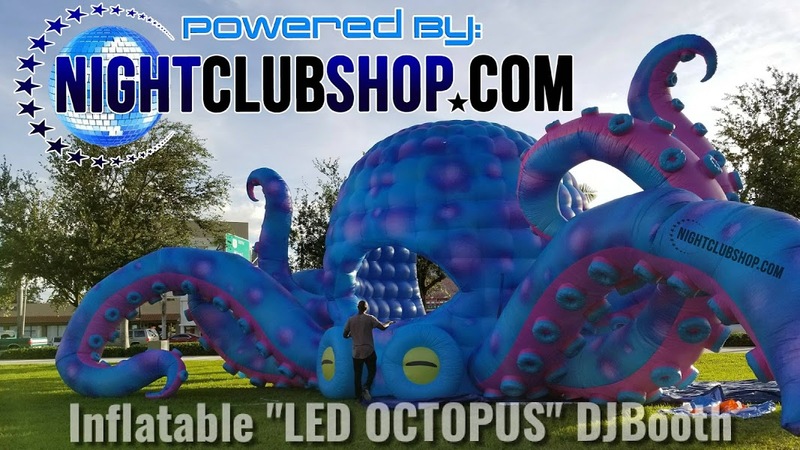 This piece also brings an upgraded 3 units of exterior wireless remote controlled LED lights that are of high potency, and will light up the outside of the octopus, change colors, and different flashing/fading modes, to highlight the exterior of the piece. One light for the left side 1 light for the center and 1 light for the right side exterior, Giving you more lighting controls and also providing the correct lighting to make this unit really stand out. This large sized inflatable uses 2 different fans/blowers To give it the optimum inflation as well as backup fan power so that not only one fan is used and strained. Depending on what country please specify whether you need 110 or 220 Volt Fan/Blowers, these also come included. Also included with this piece is enough loose material for repairs, patches, or rips,so that you can protect your investment and fix it if any accidents do occur. 10 different sandbag covers are included as well as small ropes to secure the tentacles, and a carrying case for the piece and accessories. 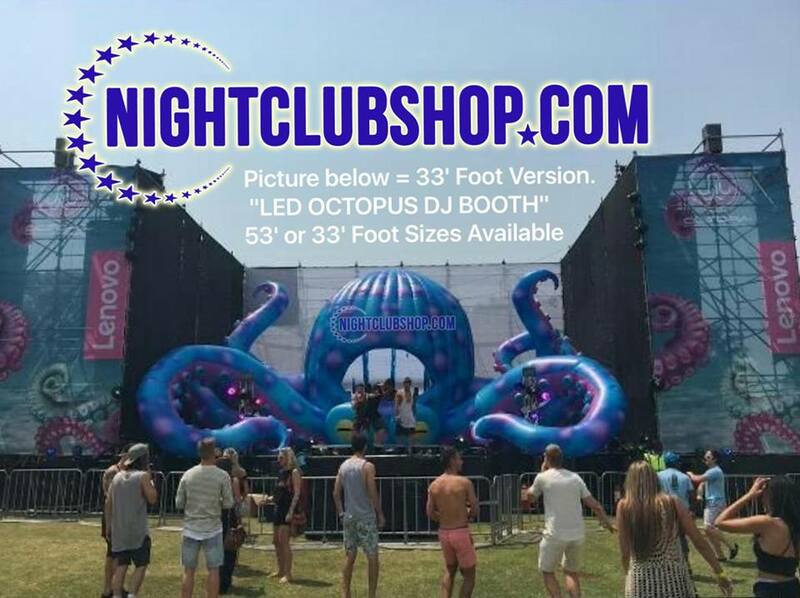 DISCLAIMER: We have Set Up a Freight/Shipping Flat Fee that covers the shipment of this Inflatable LED Octopus DJ Booth anywhere in the Continental United States. This "FLAT FEE" for Freight is only applicable for the Continental United States, and does not cover international shipping outside of the U.S.A., However, we DO ship this Item all over the world/international Freight. If you are placing an International Order, Please give us a call, or email us at Info@Nightclubshop.com so that depending on what Country it is needed in, we can get you a selection of manual International shipping Quotes. We can send via UPS, DHL, Delta Dash, or Freight Forwarder. Feel free to Go ahead and check out, and we will credit the 299.99 FLAT FEE to your International Shipping Quote Balance with whatever carrier you chose. This is not your typical, lightly coated nylon oxford. In addition to being flame retardant, it has a super heavy 1-1/2-ounce flame retardant urethane coating. ... A medium weight nylon with a urethane coating; this fabric has a nice smooth face and because it is urethane coated, it is waterproof. Usage: Promotions, carnivals, events, Halloween, party, bars, concert, Event ,party, club, performance, amusement park, rental business,family use, water park and other. 1. 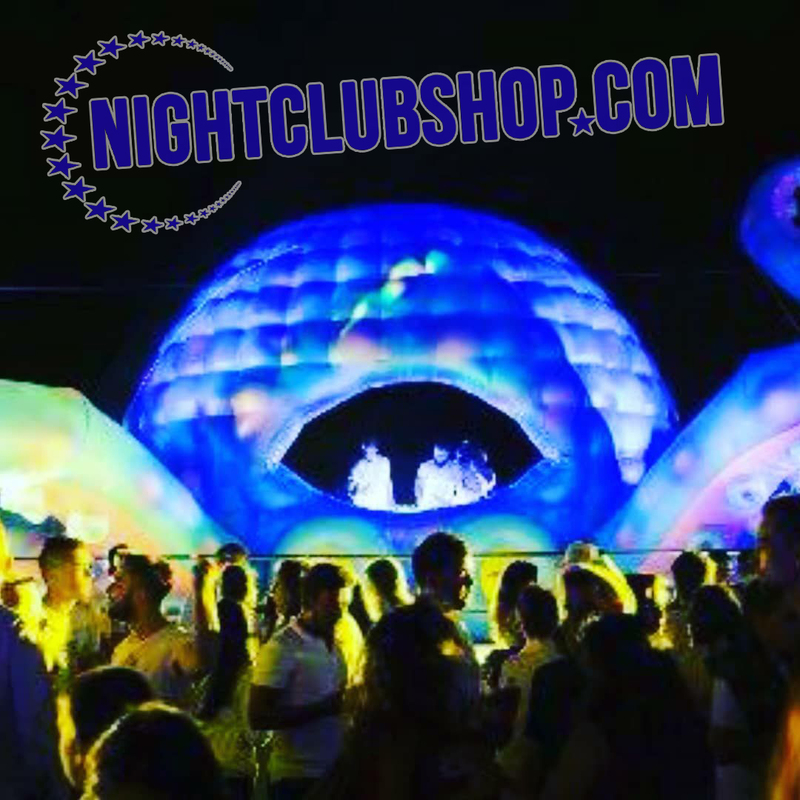 Nightclubshop.com is a trusted source for over 5,000 Nightclubs and Special Event Promoters Worldwide. 2.Our Staff has Been in this field for 20+ years. 3.Our Nightclubshop products include more than 500 kinds of innovative and hard to find Nightclub, Party, and Promo items. 4.Innovation, Creativity, Quality and concept is our developing source.